Herman A. Neufeld, son of Abram Neufeld and Helena Unrau, was born on June 24, 1860 at Jorkivka near Jekaterinoslav where his father was a miller on the Abraham Neustaedter estate. Herman Neufeld completed an apprenticeship in a carpentry and coach establishment in 1880 and began work in a carpentry shop at Kronsweide and later in a foundry at Sergeevka. During that time, he was baptized and joined the Mennonite Church. In 1883 Neufeld married Katharina Klassen at Sergeevka. On August 19, 1884 Herman and Katharina Neufeld joined the Mennonite Brethren Church. Although he still worked in the foundry and farmed, Neufeld became increasingly involved in the work of the church, preaching not only in Sergeevka, but also in the other communities of the colony. In 1887, he was a delegate at the annual Mennonite Brethren Conference at Rueckenau. In 1888, at the conference in Friedensfeld, Neufeld was appointed itinerant minister for one month for the coming year (for home missions). In 1889, he attended a four week course of Bible study conducted by J.B. Kargel from St. Petersburg, and in the same year he was appointed as itinerant minister for two months. In 1892, the Neufelds sold their farm and possessions and moved to Einlage. Neufeld entered church work on a full time basis, with an appointment by the conference to full-time home missions work. Neufeld opened a Mennonite high school in 1906; also in 1906 he was ordained as elder for the Ignatjevo district by Elder Gerhard Regehr. In the following years, Neufeld continued his involvment in preaching and conference work while becoming prosperous through farming and other business ventures. Due to the war, revolution, and famine, the Neufeld family immigrated to Canada in 1923, settling in Winkler Manitoba, where Neufeld once again had a farm and was involved in itinerant preaching and church conference work. He died in 1931 and his wife. Katharina Klassen Neufeld, daughter of Kornelius Klassen and Anna Neufeld Klassen, was born in Kronsweide, South Russia in 1864. She was converted and baptized at the age of eighteen. As the wife of an itinerant minister, she shouldered the responsibilities of home and of raising a family of thirteen children while her husband travelled. Six children predeceased their parents. After her husband died, she lived with her children in Winnipeg and was a member of the North Kildonan Mennonite Brethren Church. She died in 1940. Condensed from: Herman and Katharina: Their Story, The Autobiography of Elder Herman A. and Katharina Neufeld, in Russia and in Canada, translated and edited by Abram H. Neufeld. 1984, Winnipeg: Centre for Mennonite Brehtren Studies in Canada. John A. Toews Library: 3 copies of Herman and Katharina Neufeld: Their Story (298.7092 N482 Her). Neufeld began recording his memoirs in Russia in 1892. The first thirteen volumes take the form of a daily journal. When the Neufelds left Russia in 1923, the journals had reached half of Volume VII. Although they tried to take the journals with them, they were warned in Moscow that no books could cross the border so the volumes were left with Frank Isaak who brought them to Canada in 1925. Neufeld’s diaries came to Centre for Mennonite Brethren Studies in August, 1982. They were donated by Abram H. Neufeld of London Ontario, son to Herman A. Neufeld. The Herman A. and Katharina Neufeld fonds consists of 23 hard cover volumes of Herman Neufeld’s hand-written Gothic script. 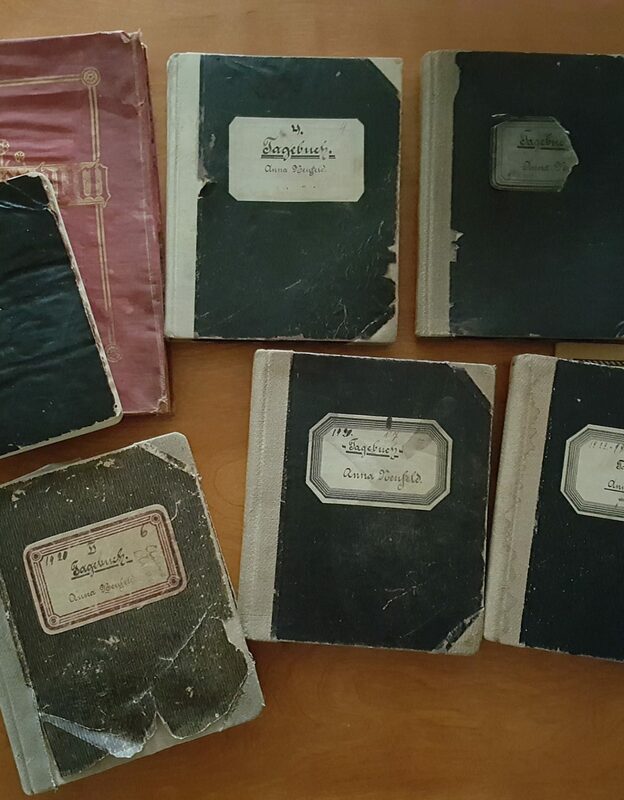 Thirteen volumes cover the life story of Herman and Katharina Neufeld; six volumes contain Neufeld’s sermons; one volume is a collection of songs, poetry, and sayings; one volume is a report of expenses connected with the itinerant ministry in Russia; two volumes are family registers. The first two volumes have been transliterated. These journals are of great importance because they trace the itinerant ministry of the early Mennonite Brethren Church in Russia and give readers a better understanding of the development of the MB Church during its beginning stages. Updated by Yvonne Snider-Nighswander, July 23, 2012. Correspondence between Ken Reddig and Abram H. Neufeld, London Ontario regarding the Herman and Katharina Neufeld collection. – 1984. Correspondence between Abe Dueck and Herman A. Neufeld, California, regarding transliteration of the journals. – 1996. Blue duotang: A translation of Volume I by Herman A. Neufeld (1832 – ) grandson of Elder Herman A. Neufeld (1860–1931). – 1996. Index to autobiography or daily journal of Herman and Katharina Neufeld of Nikolayewka (Kronstadt) Russia. A transliteration of Volume II by Gertrude Klassen, Winnipeg. A transliteration of Volume III by Tina Doerksen, Winnipeg. – 1996. A transliteration of Volume IV by Gertrude Klassen, Winnipeg. – 1996. The Herman and Katharina Neufeld collection. 23 volumes. – Written 1899, rewritten 1904, rewritten 1928.